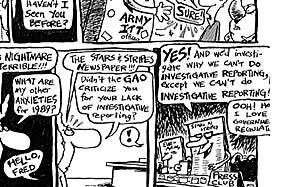 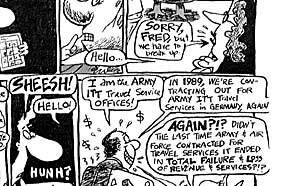 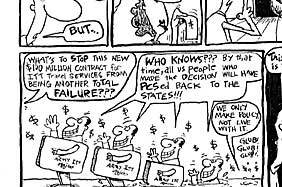 NOTE: This was one of the Fred & Frank's that had a satirical twist; making fun of the organizations in the U.S. military in Europe - the travel offices, AAFES, the Stars & Stripes newspaper and even an Army-related comic strip called "Quibbley". 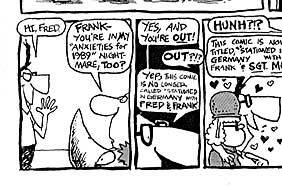 I think the Army & AAFES threatened to not allow the magazines that Fred & Frank appeared in on post anymore after this comic came out....but nobody paid any attention to them...."yeah, yeah, okay I won't do it anymore".....(not!) 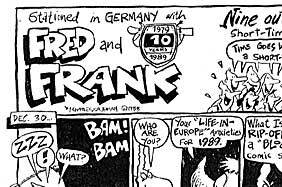 Created in 1989.